Robot programmers frequently find it challenging to deliver material handling, arc welding, spot welding, or drill and riveting programs that work with certainty on the first run. Because robot programming is not part of the design phase, they are forced to implement fixes and workarounds on the shop floor. Costs escalate as production cycles expand and changes are made without knowledge of the shop floor impacts. 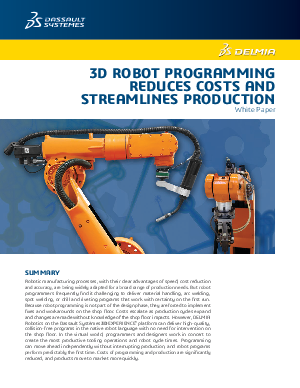 DELMIA Robotics on the Dassault Systèmes 3DEXPERIENCE platform delivers high quality, collision-free programs in the native robot language with no need for intervention on the shop floor. In the virtual world, programmers and designers work in concert to create the most productive tooling operations and robot cycle times. Programming can move ahead independently without interrupting production, and robot programs perform predictably the first time. Costs of programming and production are significantly reduced, and products move to market more quickly. Learn how offline robot programming in a 3D environment shrinks the product cycle by keeping the process collision-free, enabling robot programmers to collaborate with designers on new products. Robotic manufacturing processes, with their clear advantages of speed, cost reduction and accuracy, are being widely adapted for a broad range of production needs.